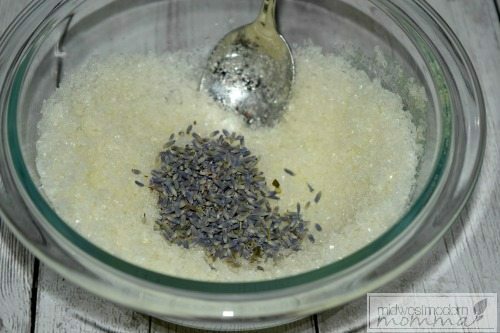 I love making homemade bath salts like these amazing lavender scented ones. They are perfect for giving you a nice at home spa experience on a budget. The aroma of the Lavender essential oil can calm your stress and help you really begin to relax. Enjoy a warm bath with a handful of Homemade Lavender Bath Salt and Lavender buds floating all around you. This is so easy to make and would make a wonderful gift as well. Lavender essential oil is one of our favorite essential oils to have on hand. It's a great soothing option that is also budget friendly. It's perfect for helping you calm down after a stressful day, and of course smells wonderful. It makes the ideal addition to our homemade bath salts recipe! If you have fresh lavender on hand, it adds even more wonderful smell and benefits to your bath. Grab a medium mixing bowl and start with your Epsom Salt. I prefer mixing in a glass bowl when using essential oils since their fragrance can linger on plastic even after washing. Now pour in your olive oil followed by your lavender essential oil and mix all the ingredients together. The homemade bath salts will have a hint of yellow from the olive oil and once it’s mix thoroughly it will have a nice bath salt texture. Now it’s time to add in your lavender buds. Feel free to add in as many or as few as you wish. Pile them on the top of the bath salt and mix the lavender buds into the bath salt. They add not only a beautiful look but also fragrance. This makes them perfect for gifting to friends and family. Spoon your mixture into a ½ pint mason jar and place the lid on tightly. When you’re ready for your bath just grab a handful and toss it into your warm water. Use 1-2 tablespoons in your bath for a wonderful smell that soothes and comforts the stress away. 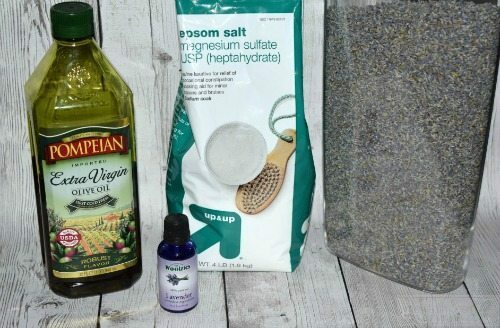 Making homemade bath salts is a great way to pamper yourself, or give a unique and soothing gift to a friend. 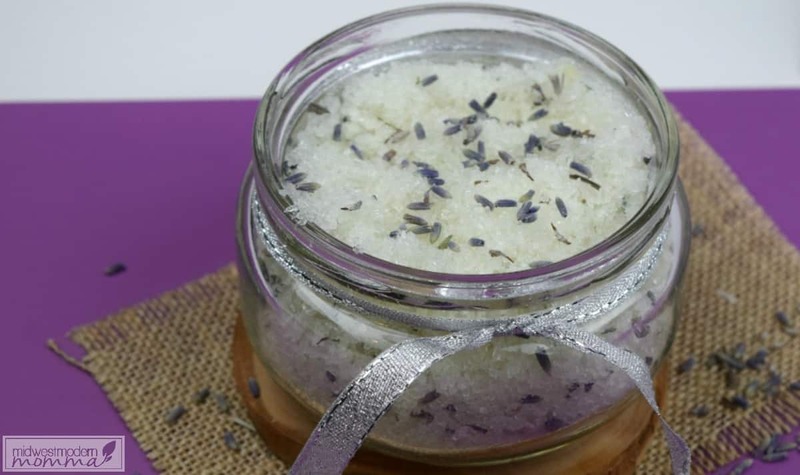 Not only will these lavender scented bath salts smell wonderful, they will easily make your bedtime bath ritual even more relaxing. Lavender is known for its soothing benefits and is a perfect way to help you fall asleep easily. This is a great way to detox and relax after a long day at work. 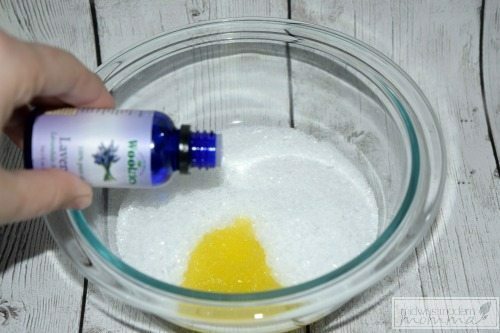 If making this recipe for homemade bath salts as a gift you can add a pretty ribbon, or you can make a printed label to make it even more special. Label with ingredients just in case someone has an allergy, but most of these products are unlikely to cause a problem. 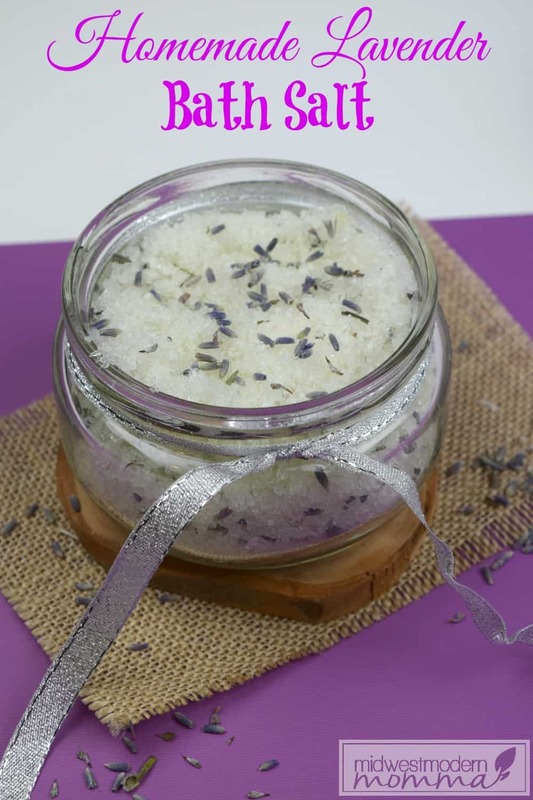 Enjoy this lavender bath salt for yourself or give as a gift!